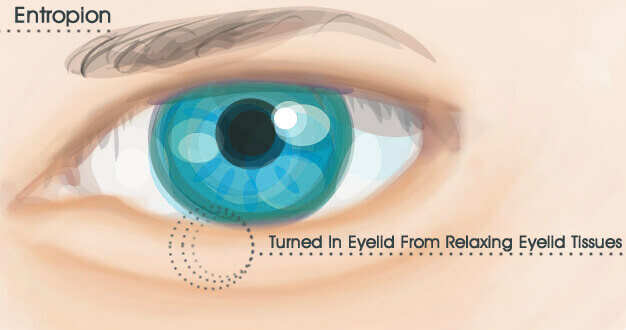 Entropion is the medical term used to describe an inward turning of the eyelid and eyelashes. The skin and eyelashes of the lower eyelid rub against the cornea (front part of the eye) and conjunctiva (membrane lining of the eye) and can cause redness, excessive tearing, eye irritation, eyelid crusting, mucous discharge, cornea abrasions, and possibly impaired vision. The most common cause of entropion is laxity in the tissues of the eyelid as a result of aging. Other less common causes of entropion can be contraction of the tissues on the inner surface of the eyelid from inflammation or chemical/thermal burns. Entropions of the eyelid should be repaired surgically before the rubbing of the eyelid and its eyelashes against the eye leads to infection or scarring of the cornea and, potentially, a loss of vision. The goal of surgery is to position the lower eyelid into its correct anatomic position. How Do I Get Started with Entropion Repair? Dr. Joseph Selem and the staff at The Selem Center for Ophthalmology & Plastic Surgery would be happy to help you set up a private consultation to discuss entropion treatments. Schedule an appointment online or call us at 305-444-0221.